Hopefully everyone is heading out to Daytona Bike Week at some point during the week. Daytona Bike Week is from March 8th to March 17th. It is one of the most popular biker events in the world, with thousands of vendors and attractions. But enough about Daytona; we all know what goes on at Daytona is pretty wild. In order for you to make it in Daytona there is a guide on surviving Daytona Bike Week, but eBikerLeather crew will introduce you to Gear Up Guide. Our Gear Up Guide for Daytona Bike Week, will leave you with all the necessary things needed for the survival. Let’s start gearing up for Daytona Bike Week. What will you need? The temperatures will be ranging from 70 F to 80 F. In order to keep yourself safe and comfy here is the first item that should be on your list. Yes, a vest that can be put over a t-shirt or a hoodie and still feel comfortable. I suggest checking our MV320 for the bestcomfort, and it is our best seller. Depending on what you feel is more comfortable for your body. I do suggest checking our both pants, and leather chaps in our online store for details. If you plan on riding your motorcycle down to Daytona Beach, you want to gear up with one of our motorcycle saddlebags. Some of our motorcycle saddlebags store up to 12 bottles of beer, and your other needed belongings. Gloves are the first essential gear item for going on long rides, you don’t want to leave your house without your gloves. Since summer is coming, we have summer weight motorcycle gloves on sale, just before summer. Grab them now, before the sale ends. Another item of gearing up for the longer journey or short ride. I recommend that you do not leave without one of our helmets on your head. First of all you grab a D.O.T helmet from our online store, and hit the road. Same goes for women motorcycle vest, should be comfortable and easy to put over a hoodie incase of temperatures dropping down. Women chaps are a great addition to their motorcycle apparel. Every women looks amazing in leather chaps, over jeans. Our selection of leather chaps or pants allows you to look hot and grab attention of bikers at the same time. Our motorcycle saddlebags look mean, and stylish. Just perfect addition to your leather chaps ladies. Our saddlebags are able to pack 5 to 8 pair of women heels. And we guarantee having all the attention on you and your red heels instead of your friends. 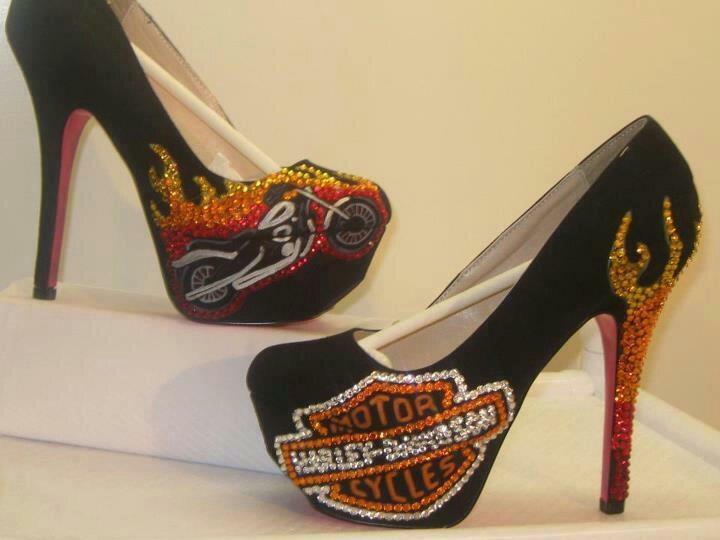 Women in heels equals biker in love. Our women motorcycle gloves will keep your hands nice and comfy for that magic touch. Ladies, I know that wearing a helmet is messing up your hair, but it is important that you do wear a helmet at all times when riding. There are tons of more products like motorcycle leather jackets, motorcycle boots etc. But we have covered the most important products that should be with you at Daytona Bike Week. You won’t be too hot, or cold when having all the above items with you. Motorcycle pants are quite beneficial due to a number of reasons. They not just help you in keeping yourself secure but also help you in making a style statement while driving your motorbike. These pants for motorcycle riders are available in different variations but you should always choose the right ones for yourself. Leather motorbike pants protect you from harsh weather conditions and also help you impress everyone around you with the style features. One can easily say that pants and safety go hand in hand if you are a motorbike owner. Here, we are going to talk in particular about pants for motorbike riders. We all would agree with the fact that bike riding is something exciting and interesting. To say the least, it is the favorite pastime associated with all the teenagers. With proper protection you can definitely keep yourself safe and enjoy this pastime. Check out the points given below carefully if you really wish to know more about these motorcycle pants. You should always remember one thing that wearing pants with some uneven edges or fringe at the downside can prove to be quite risky if you are riding a bike. These pieces can easily get tangled in the motorbike’s hardware and so you might be putting your life at risk. Several motorcyclists are not aware of the risks that are connected with wet pants while riding a motorbike. Heavy moisture or sweating can definitely cause the bike’s seat to become quite slippery and therefore you should be very careful about choosing the right fabric of the pant. Even though the pants with signals of moderate wear might be quite trendy and so you should avoid wearing such things as heavy wear can be quite risky to go for. Pants with certain holes can surely make your skin get burned under the influence of sun. Therefore, you should avoid wearing such pants. If you want to avoid any unnecessary injury or harm you should consider wearing long leather pants every single time. Capri pants and shorts expose your skin a great deal and so you should stay away from them all the time. For more tips on biking cloth materials you should take tips from an expert. Not many people are aware of the fact that materials such as wind breaker and mesh should never be worn while you are riding a bike. These are quite thin materials and they can never protect your skin from damage. All in all, one can easily say that motorcycle pants should be purchased after thorough consideration. You should follow some crucial points in this regard and consider seeking some online guidance through well-renowned motorcycle blog. Different types of materials are used to prepare such pants but you should always choose leather pants. Such leather pants are not just quite strong but quite long lasting as well. They will surely serve you for a long period of time. Go ahead, and buy great pants for yourself. It will enhance your overall experience of bike riding. Guest post by Kiara, click here to visit Kiara’s Blog. How many of our readers would allow lights on motorcycle gear? I would definitely allow it, but maybe with less options than they have now. 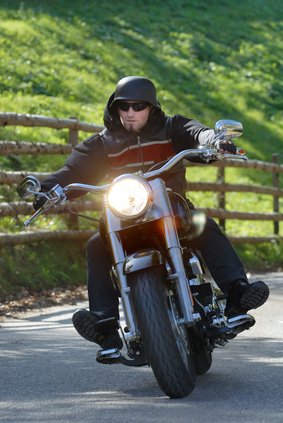 The gear would be used when only on a motorcycle, if stopping or backing up or on a ride. For example when you brake, the light would be brighter to inform people behind you that you are braking. I don’t think this would be a bad idea to have lights on motorcycle gear; apparently Holland thought differently. If you have more information on why did Holland ban lights on motorcycle gear, share it with us. The jacket has flexible L.E.D. and comes with 7 different modes of lights, including being water proof. Visit Street Lightning LLC wesbite, click here. Check out the video and see for your self that this is great way to improve bikers safety. Each year we face the same questions over and over. However, with our help of Valentine Day gift ideas you will not face the same questions this year. Our guide will help you choose the correct Valentine’s Day gift for your loved ones. With our full selection of motorcycle apparel, and motorcycle accessories you will be able to get the perfect gift for your loved one. Our guide will focus only on couple products instead of our whole inventory. We are not done yet with new products! Yes, we will keep them coming to you. Another great product that we would like to introduce is this LJ112-CC. As you may have noticed our products don’t need an introduction, they will WoW you without our introduction. This women’s mesh and textile racer jacket is featuring reflective stripes on front and back. Zippered cuffs on this jacket will keep your arms worm, while on the long road rides. More information about this jacket can be found by clicking here. Today’s post will be made by Joanne, our co worker. We are so happy to announce a new product to the collection of women’s motorcycle jackets. This jacket is amazing the feel and look are irresistible. The jacket features a hoodie for cold nights. Remember ladies when you had those nights sometimes by the fire pit, with your biker friends? This would be a perfect way to warm up. Our jacket features extremely durable material, with removable padding in shoulder, elbows, and back. We have put the jacket to the test meaning, we have tried to tear. This jacket is made out of material that is resistant to tearing. Our tests have failed and we were not able to tear it. What I love about the jacket? Who does not love pink? I love pink, and that huge butterfly on the back just did it for me. I was not able to take my eyes of the butterfly. There are 2 butterflies one on front and bigger one on back. You cannot forget the pink hoodie, or the sleeves that allow your hands to be covered. Over all, as you can see we are very happy to introduce this jacket, and hope that everyone likes it. We are going to start bringing in different products slowly to stay on top of the trends. More information on LJ7010-CC can be found by clicking here.